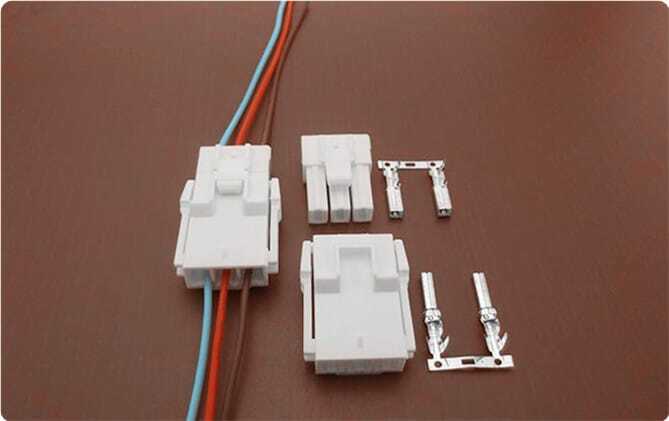 SCT6203 Series connectors are compatible with JST VL 6.2mm series wire to wire connectors. Scondar offers the SCT6203 Series, a replacement and cheaper alternative of JST VL 6.2mm wire-to-wire connector, designed for large current. It features a secondary retainer, which prevents from the insufficient insertion of contact and coming off contact, may use. Large current circuit can be connected certainly and safely. This connector comes in a complete package: from the male housing, female/receptacle housing, female terminal, and male terminal. All components manufactured with precision-fitting and durability ensuring accurate mating. JST VL 6.2mm pitch connector supports up to a maximum 20A of current per circuit allowing quick swapping of wired terminals for disruption-free operations in consumer, automotive and industrial applications. This economy power connector is designed with 1,2,3,4, and 6 positions. The contacts can be easily inserted while being securely locked into the housing since the contact retention lances are part of the housing rather than protruding from the contact. With this design, they cannot be damaged by handling. A secondary retainer can be optionally available and is used to ensure that the contacts are seated in place and locked in the housing, preventing an accidental release. This is installed after the contacts are inserted, it locks and secures the contact. Since these contacts have large cross-sectional areas and high contact pressure, they can accommodate circuits requiring high power. Our unique space-saving panel lock is designed to prevent tangling with wires or breaking in cold or dry weather. The housing components are injection molded Nylon66,UL 94V-0. These are scientifically proven to resist UV-radiation than normal plastic, making sure the connectors are well-protected, reducing risk for early degradation and increased cycles/minute of the connector subjected to harsh environments. The tape and reel packaging strip has accurately sized cavities for the terminal height, width and depth, secured tightly, maintaining consistent position during transportation. You can expect that your wire-to-wire connector package is undisturbed during the trip and has maintained its vitality even during your production stages, which is why a lot of our customers has raved about our product for both cheaply-priced and, at the same time, resembles the JST VL 6.2mm pitch wire-to-wire product in performance and quality.